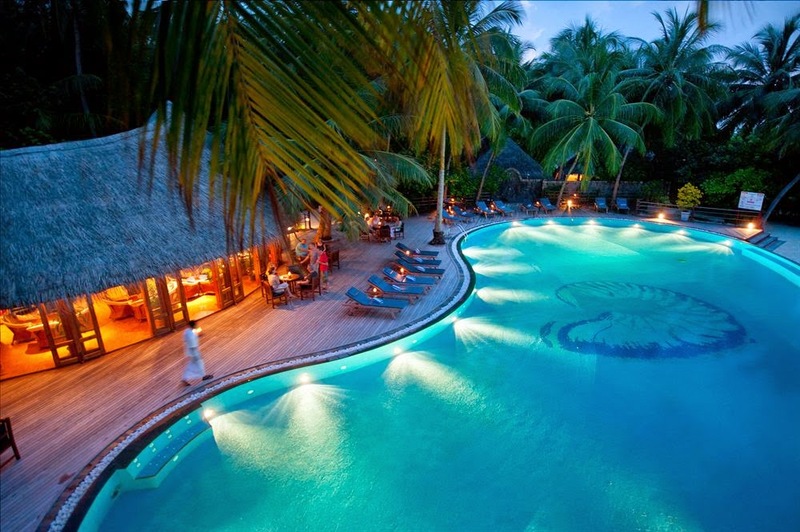 Sun Aqua Vilu Reef is found on Meedhuffushi Island, a beautiful bite-sized jewel in the Maldives’ South Nilandhe Atoll. 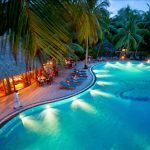 A spectacular 35-minute seaplane flight from Ibrahim Nasir International Airport, our little slice of bliss is lush with coconut palms and fringed by colourful corals. 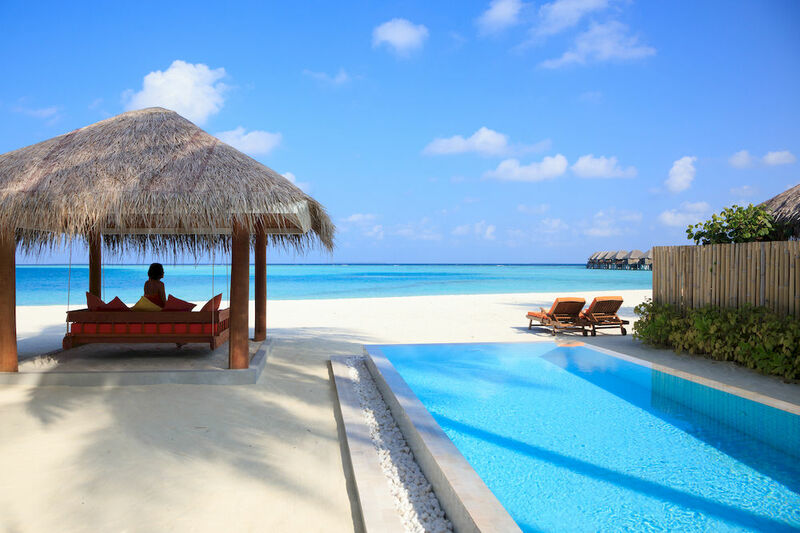 We’ve got pristine, powder-fine sand, translucent turquoise waters and staff ready to help you 24/7 – the perfect ingredients for fun and relaxation. 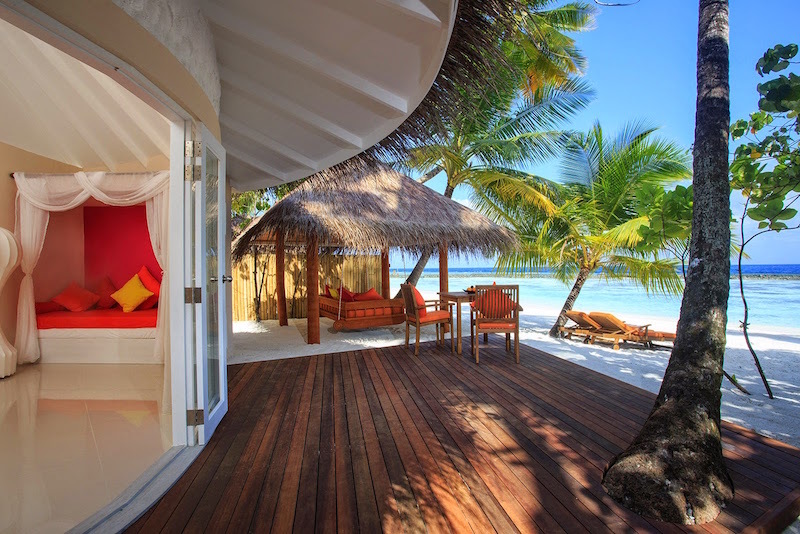 Bask in the warm embrace of the sun as the gentle lapping of wave’s lulls you into blissful oblivion. 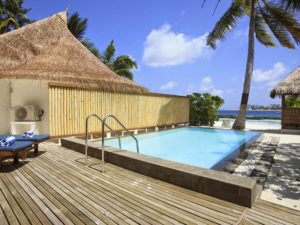 With your very own Jacuzzi and chaise lounge on the extended deck overlooking the lagoon, as well as a swim-up platform with private stair access to the lagoon, this picture of contentment is yours any minute of the day. 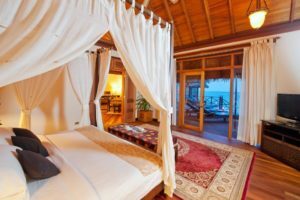 Inside, you’ll be equally delighted with the array of amenities, from a sumptuous four-poster bed to a generous sitting area appointed with custom made teak furniture. 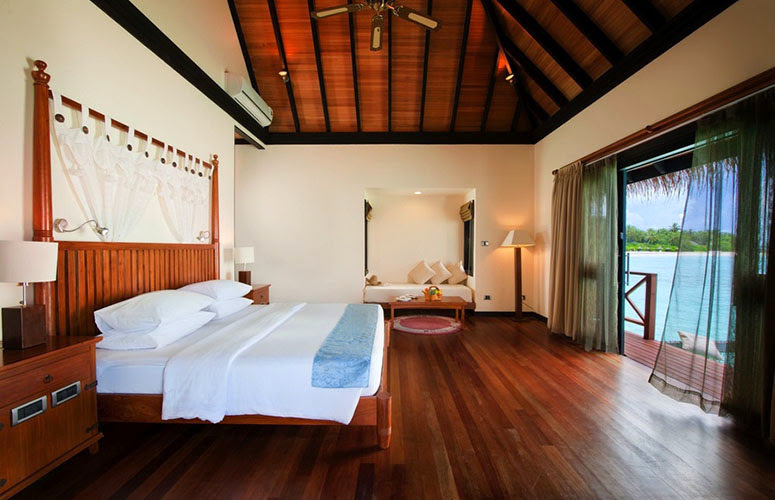 Villas on the sunset side is available at a supplement or can be booked separately, presented as Sunset Jacuzzi Water Villa. For an intimate getaway with all the comforts and luxuries of the privileged few, look no further than the Honeymoon Water Villas – an exclusive haven nestled within the island paradise of Maldives. Besides all the amenities of the Jacuzzi Water Villas, each Honeymoon Water Villa comes with a separate living room with floor-to-ceiling glass panels bringing the splendour of nature right to your doorstep. 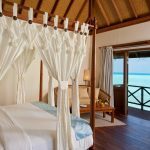 Situated on stilts over the water, each villa boasts panoramic ocean views and direct access to the lagoon via private stairway where guests can get up close to a whole host of multi-coloured friendly fish without venturing far. 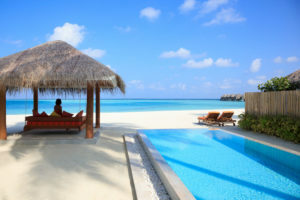 For added relaxation, the Maldives water villas with pool comprise a large balcony with an extended sun deck, infinity plunge pool, chaise lounges for private sunbathing and a large hammock suspended over the lagoon for those long lazy days in the sunshine. 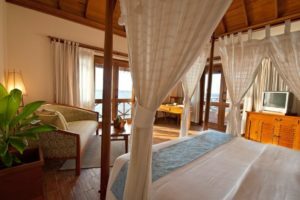 The interior comprises a large bedroom with a double bed, a day bed which can accommodate an additional third person, a dressing area and a bathroom with a large roll-top bath. 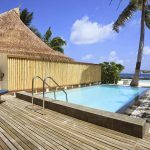 Indulge in the height of luxury in the sole presidential water suite accommodation, a sumptuous retreat at the far northern end of the Maldives Resort where the two footbridges meet. 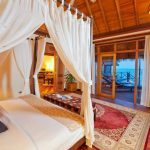 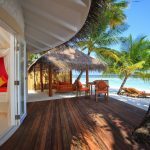 An exquisite balance of modern design and traditional Maldivian architecture, this suite will transform your stay into something quite spectacular. Bask in your private plunge pool with Jacuzzi on the double-leveled timber deck, or enjoy spectacular views of nature’s grandeur from your glass-walled living room. 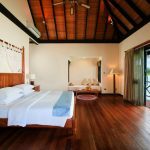 Or simply get away from it all in either of your two king-sized bedrooms with en-suite, a well stocked kitchenette and a luxuriously appointed dining area.